This is the last weekend of the Dixie Classic Fair. I've been working it for most of the last 7 days and I never thought I'd ever tire of seeing the sights and smelling the scents of the fair. I think I've seen, eaten, smelled, touched, and experienced more than my "fair" share of this yearly event. 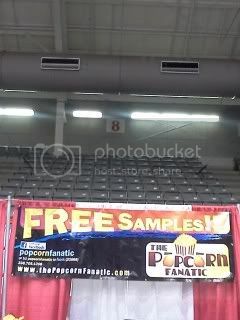 This is the booth where I've been working all week. My *new* place of employment! 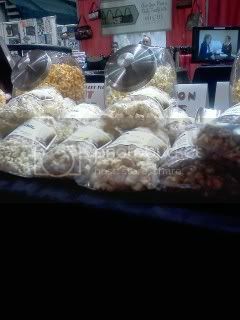 We've got over 100 flavors of popcorn and a sampling of nearly 15 here: cheese, caramel, cinnamon kettle; unique flavors such as dill pickle, buffalo wing, salt & vinegar, banana pudding, Snickers, candy apple and more! One of the most down-home items at the fair is a collard green sandwich. That's right, folks. A collard. Green. Sandwich. As you may well know, I am fueled by collard greens and butterbeans, but this took my motto to a new level. 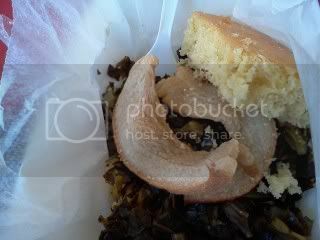 Sandwiched between two pieces of sweet cornbread, hot collard greens and two pieces of crispy, salty, fatback. I am not a fan of the fatback and I've never cooked it or with it, but it acted like a crouton, a foil to the cornbread and matched well with the collards. Next, there is nothing more homemade and satisfying than a grilled cheese sandwich. It's familiar, filling, and usually inexpensive. How does $2 sound? Visit the Professional Firefighters of Winston-Salem and get a grilled pimiento cheese sandwich for only 2 bucks. Talk about "nom nom nom"! Look at that ooey, gooey cheese. Mmm. $2. Mmm. Sounds 'bout right, don't it? Steak, buttered potatoes, onions, peppers & a dinner roll. 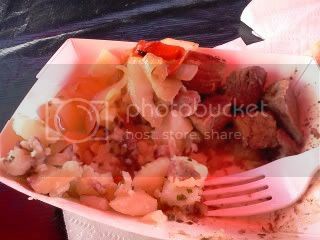 Visit the Chuckwagon & get some "Bits & Pieces" which includes steak tips, buttered potatoes (which I think was margarine and dried parsley flakes), bell peppers and onions with a dinner roll. It was pretty good. Not the worst, not the best, but the steak was moist, juicy and hot. Ok, here is the portion of the program where it gets weird. I've made you comfortable with familiar foods and now I am set to freak you out with the crazy fair foods that are out there (that I've tried). That's right. 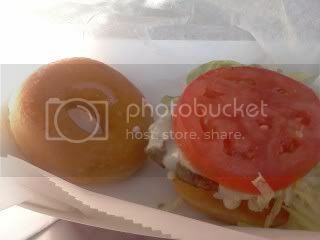 That is the ubiquitous Krispy Kreme burger. Yes, folks. The Krispy Kreme burger. For $6, two original glazed doughnuts, hamburger patty with your choice of lettuce, tomato, onions, and pickle with the option of adding cheese for 50 cents or bacon for $1.00. I added cheese and I was afraid. Afraid of the burger being nasty. Afraid of being stopped by the food police as I stepped away from the booth. 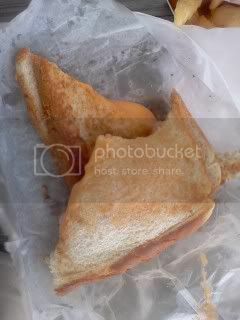 Afraid of dropping the little boat of KK Burger before finding a place to sit down and munch. I will say this: it was tasty, messy and something I will never, ever eat again. If the mood ever strikes me, I'll head over to Stratford Road and pick up a couple of doughnuts and make this. Highlighted on the local nightly news, I was intrigued by the sheer ridiculousness of it: DEEP FRIED BUBBLE GUM. I mean, everything is deep fried nowadays: belts, shoes, lamps, Oreos, butter... the list goes on! But this monstrosity takes the cake. Or takes the bubble gum, I should say. The farce that is deep fried bubble gum. 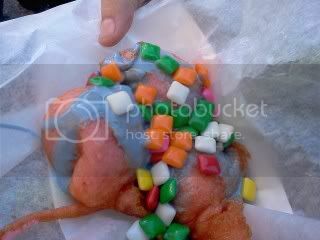 Deep fried "bubble gum" is this: Three marshmallows dipped in a bubble gum flavored batter, deep fried, drizzled with blue marshmallow creme sauce and sprinkled with Chiclets. Nasty. I only tasted a little of it. Another item I will never, ever try again. It's not so much an experience as it is a novelty item to buy for a mere $5. 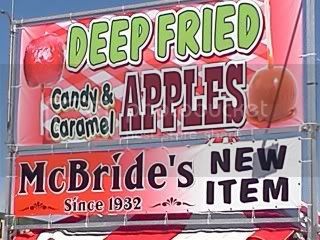 I can't wait for the deep fried lard balls with grease gravy.